When this 180 ft (54.9m) triple screw work boat recently docked for repairs, the ThorPlas-Blue bearings previously retrofitted to the vessel’s tiller and jockey bars by precision field machining company Mactech On-Site showed no signs of wear, despite two years operating in the abrasive, low draught waters of the Mississippi River in the U.S.A. In response to the customer’s request for grease and corrosion-free tiller linkage capable of withstanding greater vertical movement of tiller pins, Thordon’s grease-free ThorPlas-Blue bearings were retrofitted to the triple screw towboat in 2016 with Mactech replacing the bronze bushings in the vessel’s steering. Based on the results and performance of the Thordon bearings on this vessel, the customer has now opted to retrofit ThorPlas-Blue to 10 additional workboats. Prior to any retrofit project, Thordon and its partners will measure and record all as-found bushing data before creating a mock-up steering linkage. After this, new bushings are machined to size and clearance before fitting to quadrants and jockey bars. New wear plates are then manufactured for each pin joint and the steering system is reassembled with new pin retainers. 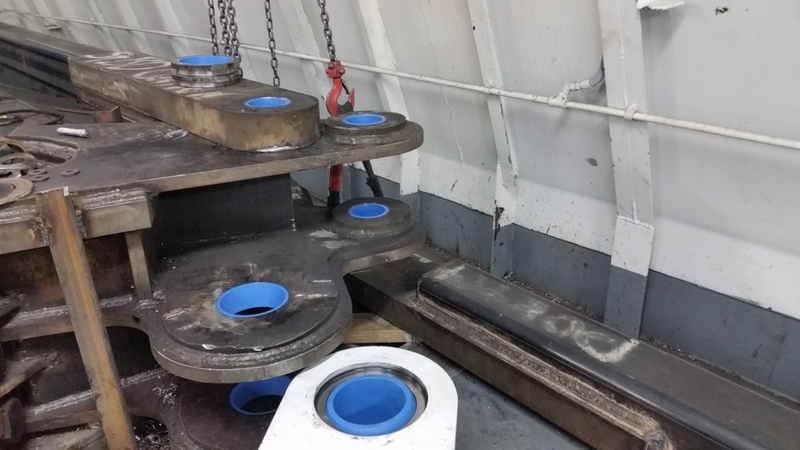 “The ease of machining allows the bushings to be finished quickly so that repairs and retrofits can be completed on time and without costly drydocking,” said Glisson. ThorPlas-Blue is a homogeneous, self-lubricating polymer bearing with a low dry coefficient of friction, high strength, and low creep.